Need a simple but powerful email newsletter system for your ecommerce business? Packed with a long list of real-world features, MailChimp is one of the most powerful and flexible email marketing platforms and includes plans for every budget (including free!). Manage subscribers, send professional email newsletters and even generate custom signup forms for your website. We’ve developed our MailChimp Email Marketing Integration add-on to seamlessly join your shopping cart and your email newsletter campaign for maximum marketing impact. 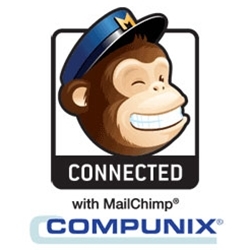 If you don’t already have an account with MailChimp, getting started is easy. You’ll be adding subscribers and sending great looking email newsletters in no time! One of the most valuable integration features of our MailChimp add-on is the option to add subscribers directly from new and existing account pages as well as from the checkout page - all at the click of a button. If you’re developing an email marketing campaign, this addition to your ecommerce system will be a valuable tool to keep your customers up to date. Double opt-in - After submitting the sign up form, new subscribers receive an email with an activation link. This extra step verifies the legitimacy and interest of every new subscriber, so you can be confident your email newsletters are reaching your target audience. Welcome and goodbye emails - Automatically send a welcome email to demonstrate the quality of your email newsletters and build confidence with new subscribers. For customers who choose to stop receiving your newsletter, automatically send a professional follow-up message. Subscriber delete option - Direct access to your complete email list makes it easy to browse, edit and even remove specific subscribers. Complete email newsletter campaign management from top to bottom! Response:HI Greg, the signup form you are referring to is given to you via Mailchimp so just have to embed it. This plugin does the heavier integration between account/create account pages and MailChimp. Also, we include the ability to tie into the MailChimp sync function from other location so developers have a handy simple API to use as well. Response:It uses the Ok to Email customer account setting to determine if the email/customer should be synced over to MailChimp. We offer callouts/API in this plugin to integrate the module with other customizations you may have in your cart as well! Response:Yes, this is a direct integration with MailChimp API supporting all their account types. You will be required to setup a MailChimp account (they start free) which the add-on "talks" with. Response:Yes, our MailChimp integration exposes several API calls so you can bind any other features and or custom modifications in AspDotNetStorefront you have. We allow you to sync using the Customer object or values directly.